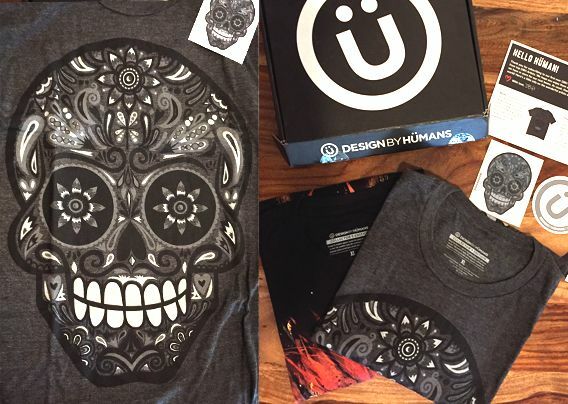 Design By Humans launched a subscription box in December 2015. The first box was art directed by Sage Hagan, who invited me to be the very first featured artist in a DBH subscription box. The box comprised of two limited edition T-shirts only available by subscribing to the box. The theme was Birth and Death, thankfully I got Death. It seemed fitting to submit a Calavera Day of the Dead skull, as that’s a style I am very well known for at DBH. I created ‘Calavera V’ in vector form using a limited grayscale color pallet. The final tee was printed on a super soft heather charcoal tee using discharge inks for a quality finish. The box, when assembled consisted of two tees, mine and a ‘Birth’ themed Phoenix design by the very talented Studio8worx. Packed with the tees were sticker sets, postcards and a card describing the theme and artist bio. This was an interesting challenge and something different for me, an honor to be placed next to such a talented artists. I’m told it was received very well by the fans too. Man I wish I’d got this when it was available. Awesome work.